Jobu belatedly reviews the Yankees’ weekend series against the Oakland Athletics. The last time the Yankees faced the Athletics, it wasn’t pretty. 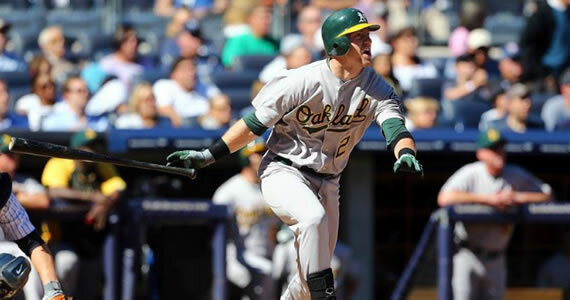 They were swept in a four game set in Oakland and the A’s had walk-off hits in three of them. That sweep was pretty much rock bottom for the Yankees, and it sparked the A’s on their current run at one of the Wild Card Slots. In this series, the Yankees gave the A’s some of their own medicine, using two walk-off wins to take the series two games to one. The Yankees sent CC Sabathia to the hill against rookie sensation Jarrod Parker in this game, so I figured the five game winning streak they came into the series with had a great shot at being over. Boy, was I wrong. Sabathia really flashed that Ace stuff that made him the highest paid pitcher in baseball, pitching eight shutout innings and striking out double digit batters. There was one really scary moment in the top of the eighth when the A’s loaded the bases, but CC got a big fly ball out to end the threat. His final line was phenomenal: 8 Ip, 3 H, 0 R, 2 BBs, 11 Ks, 113 pitches and, unfortunately, a no decision. The no decision came about because of a rare blown save by Alfonso Soriano. Soriano gave up a deep fly ball for the first out of the inning, and then Brandon Moss got a hanging slider and crushed a no-doubter to right to tie it. Soriano just didn’t have it in this game, but he battled through the rest of the inning and held the tie in place. David Robertson came in to pitch a perfect top of the tenth, and he ended up with his second win of the year (2-7) when the Yankees walked off in the bottom of the frame. The Yankees had a pretty terrible day offensively. Parker continued his great pitching by hurling eight innings and only allowing one run. It came in the bottom of the fourth on a sacrifice fly by Curtis Granderson. That was it. It would have been a very tough loss for the rookie, so I’m sure he was thrilled to see the A’s tie it up in the ninth, but it would be short lived joy. The A’s turned to Sean Doolittle after Parker left the game, and the good doctor made the decision look wise with a scoreless bottom of the ninth inning. Unfortunately, he wouldn’t make it past the first batter in the bottom of the tenth. Russell Martin hammered Doolittle’s first pitch well over the fence in left field, and the Yankees had a 2-1 walk-off win. It was Martin’s second walk-off home run of the season, and it came at a great time. This was probably the win of the season. It had everything you could possibly want from a game, including multiple lead changes, excitement and even 14 innings! The game was 5:43 long, and was started by Iván Nova and Travis Blackley, neither of whom made it through the third inning. The Yankees used an improbable comeback in the bottom of the 13th, and an error in the 14th to win it, 10-9. In his first start off the DL, Nova gave us hope that he could help stabilize a struggling starting rotation. In his second start, he might have pitched himself out of it. Nova was brutal in this game, lasting only 2.1 innings and giving up seven base runners and three runs. The rest of the bullpen was pretty phenomenal. Clay Rapada (1.1 Ip, 1 R), Derek Lowe (2.2 Ip, 1 R), Boone Logan (1.1 Ip, 0 R), Cody Eppley (0.1 Ip, escaped Logan’s bases loaded jam) and Joba Chamberlain (1 Ip, 0 R) were pretty wonderful in relief of Nova. Girardi then turned to Freddy García, who pitched two scoreless innings before completely melting down in the top of the 13th. Freddy, who hadn’t pitched in a long time and was probably tiring, allowed a two-run homer to Johnny Gomes and a solo bomb to Yoennis Céspedes (good thing we didn’t sign this guy) before giving way to Justin Thomas, who got an out and allowed another bomb, this one to Chris Carter. The derby gave the A’s a 9-5 lead, and the game seemed all but over. Fortunately, the Yankees had their comeback, and Cory Wade pitched a scoreless 14th and eventually got his first win of the season (1-1). That’s the only word I could really find that accurately describes what happened in this game… dowsers. Nova put the offense in a two run hole in the top of the first, but the Yankees came back with three of their own against Blackley. Ichiro Homered to open the scoring, and Robinson Canó (single) and Andruw Jones (walk) each drove in a run to give the Yankees a 3-2 lead. I’d skip right to the extra inning heroics, but there was one more key moment early in this game that I should touch upon. In the top of the fifth, Raúl Ibañez pinch hit for Casey McGehee (heeeee) and launched a solo home run that, at the time, gave the Yankees a 5-4 lead. The A’s ended up tying the game, and then took that huge lead in the top of the 13th inning. That’s when the Yankees really went to work. Ichiro started the inning off with an infield single, and subsequent singles by A-Rod and Canó loaded the bases. Pat Neshek was brought in to try to get out of the jam, but he threw a wild pitch, which scored Ichiro and moved everyone up a base. After a Sacrifice fly by Eduardo Núñez scored made it a 9-7 game, that man Ibañez came up again. Neshek fell behind 3-1 and had to come in with a fastball, and Ibañez, who had doubled in his previous at bat, launched a game tying home run to right. It landed in the second deck. Just a majestic shot. This game wouldn’t end until the next inning, however (and neither will this review, unfortunately). Tyson Ross came in to pitch for the A’s and allowed a leadoff single to Eric Chavez, who was pinch-run for by rookie Melky Mesa. Jeter moved him to second with a bunt and Ichiro was walked intentionally to bring up Alex Rodríguez. A-Rod laced what seemed to be the game winning single into center field but Mesa, who was making his major league debut, missed third base on his way home. He didn’t compound his bonehead mistake by continuing home though. He went back to third, which at least salvaged the situation. After Mesa was forced at home on a grounder by Canó, Núñez hit a spinning grounder to Moss at first. 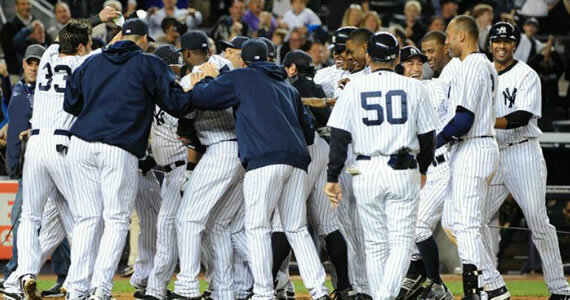 Moss booted it and the Yankees won, in dramatic fashion, 10-9. What a win! The Yankees went for the sweep in game three with Hiroki Kuroda on the mound, while the A’s countered with another rookie, A.J. Griffin. Neither man pitched all that well, but Kuroda was worse, and the A’s won it 5-4. No walk-offs, no extra innings… just a regular old boring loss. It’s hard to get too down on Hiroki. 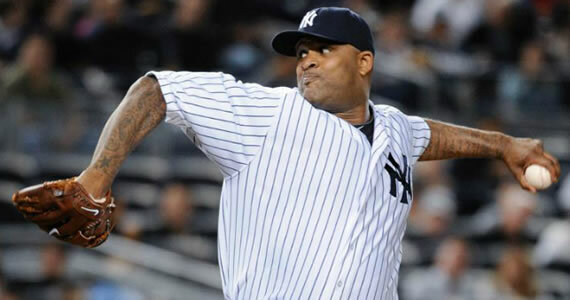 He pitched out of his mind when the Yankees needed him most in the couple of months they really struggled. In the last few weeks, he’s been coming back down to earth, and it’s OK because the rest of the rotation has stabilized. He never really got it going in this game, and his final line was a little disappointing: 5.2 Ip, 7 H, 5 R (4 earned), 3 BB, 5 Ks, 102 pitches and his eleventh loss of the season (14-11). The bullpen did a great job of holding the A’s at five runs, but the offense didn’t have a miracle comeback in their bag of tricks in this game, and the A’s salvaged game three. Four runs isn’t exactly a boat load, but it should be good enough for the Yankees to win most times out. Unfortunately, it wasn’t meant to be in game three. The Yankees actually only scored in one inning, but it was enough to give them a 4-3 lead at the time. Swisher got things started in the bottom of the fourth with a two-run homer. The now red hot Ibañez kept it going with an RBI double later in the frame, and Núñez drove in the fourth and final run with a ground out. Unfortunately, Kuroda would blow the game, and the A’s bullpen would hold them at bay for the rest of the game. I guess one ridiculous comeback was enough for this series.